It's Christmas Eve and snow is all around in this festive village scene. Villagers are congregating for late evening carol singing and others are gathered around the Christmas tree in the centre. 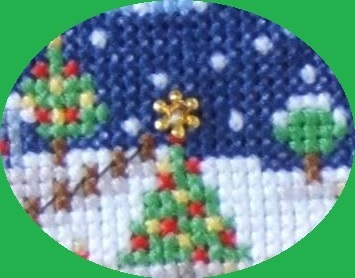 Atop the tree is a star sequin and seed bead for extra sparkle. This cosy scene is framed with Holly leaves and a burnt gold background, with a Merry Christmas sentiment to complete the design. 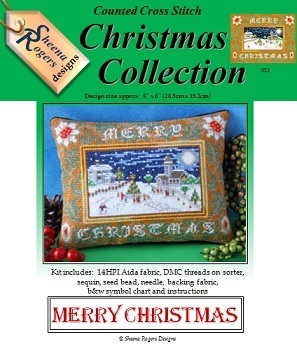 This Christmas Mini Cushion Cross Stitch Kit includes: 14HPI white aida fabric, ready-sorted DMC stranded cotton threads on a card sorter, needle, backing fabric, sequin, seed bead, b&w symbol chart and instructions (cushion filler not included).